Whether consumers are interested in a basic primary lift or something a bit more powerful for those looking to conquer the most extreme off-road terrain, we have ordered and installed many lift kits on just about everything ranging from light-duty and heavy-duty pickups, and Jeep vehicles too. Lift Kits are an easy way for consumers to increase their vehicle’s ground clearance and numerous off-road approach angles as well. Not to mention that your pickup or SUV will have some serious curb appeal thanks to Cape Coral Chrysler Dodge Jeep Ram. 5-7” Kits – fits up to 35” – 37” tires. Commercial customers will be happy to learn that Cape Coral Chrysler Dodge Jeep Ram is happy to help configure any heavy-duty truck or full-sized cargo vans for any job. In vans like the Ram ProMaster or Ram ProMaster City, an upfit can make the world of a difference by transforming the bed of a truck or cargo area of a van into an efficient and orderly space. Some peculiar configurations include an ambulance setup and a Dump upfit. Said dump upfit is equipped with an underbody electric or hydraulic hoists and drop-sides that make the loading/unloading of soil, mulch, sand, or any other materials a lot quicker and make this specific upfit a perfect choice for construction, landscaping, farming, and many other uses. There’s also another popular upfit configuration called the Wrecker Upfit. Perfect for any demanding job, the Wrecker upfit is here to help with increased electrical loads, additional storage space, and powerful hauling strength. The Wrecker Upfit is suitable for auto repair, highway maintenance, and emergency vehicles. Cape Coral Chrysler Dodge Jeep Ram offers several options for consumers interested in boosting horsepower and torque in any pickup truck or high-performance vehicle. Services such as changing out an exhaust manifold, adding cold air intakes, new performance headers, and upgrading exhaust systems are some of the most common performance-oriented mods that are performed at Cape Coral Chrysler Dodge Jeep Ram. One simple modification – the addition of a cold air intake system – plays an important role in boosting torque and horsepower. As cooler air travels through the directional cone filter and is funneled directly into the intake manifold, the additional oxygen in the combustion chamber improves horsepower, acceleration, and fuel efficiency. No matter the project, Cape Coral Chrysler Dodge Jeep Ram has a service and parts department that has the expertise and professional drive to complete any type of custom job. You can reach our parts department at (239) 785-2401 and our service department at (239) 500-0000. Get Jay's Price Today! ABS brakes, Compass, Electronic Stability Control, Low tire pressure warning, Traction control. 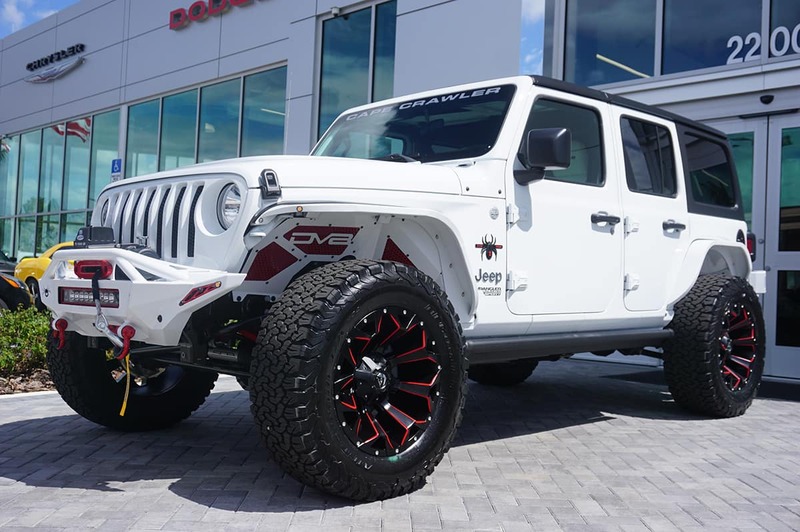 2019 Jeep Wrangler Unlimited Sport S Hellayella Clearcoat 4WD 8-Speed Automatic 3.6L 6-Cylinder #custom Cape Coral Chrysler Dodge Jeep Ram wants to be your dealer. With the friendliest staff is Southwest Florida, the newest state of the art facility, 52 bays of service, 5 service lanes, automated car wash, free refreshments, and over 40 banks to get you the best deals possible on your new vehicle. All vehicles have an 899.99 pre-delivery service fee and a 289.99 electronic filing fee. Call Cape Coral Chrysler Dodge Jeep Ram for all your automotive needs or with any questions about our listings. Price includes dealer added accessories. Get Jay's Price Today! ABS brakes, Compass, Electronic Stability Control, Heated door mirrors, Illuminated entry, Low tire pressure warning, Remote keyless entry, Traction control. 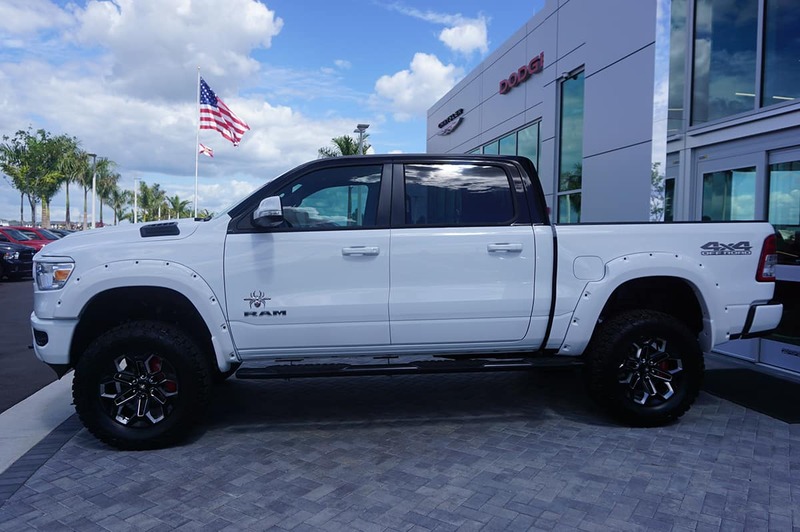 2019 Ram 1500 Big Horn/Lone Star Flame Red Clearcoat 4WD 8-Speed Automatic HEMI 5.7L V8 Multi Displacement VVT #CUSTOM Cape Coral Chrysler Dodge Jeep Ram wants to be your dealer. With the friendliest staff is Southwest Florida, the newest state of the art facility, 52 bays of service, 5 service lanes, automated car wash, free refreshments, and over 40 banks to get you the best deals possible on your new vehicle. All vehicles have an 899.99 pre-delivery service fee and a 289.99 electronic filing fee. Call Cape Coral Chrysler Dodge Jeep Ram for all your automotive needs or with any questions about our listings. Price includes: $750 - 2019 Retail Non-Prime Bonus Cash **CK1V, $3,000 - 2019 Retail Consumer Cash **CK1 (excl GL-SW-WE), $1,000 - 2019 Truck Owner Conquest Retail Bonus Cash 38CK5, $500 - Southeast BC Bonus Cash SECKA, $800 - National RAM LD Select Inventory Bonus Cash 40CKB, $500 - Chrysler Capital 2019 Bonus Cash **CK5 (CA,MA,SE,SW), $500 - 2019 Retail Bonus Cash SECKA1 Price includes dealer added accessories. Get Jay's Price Today! ABS brakes, Compass, Electronic Stability Control, Low tire pressure warning, Traction control. 2018 Jeep Wrangler Unlimited Sport S Red Clearcoat 4WD 8-Speed Automatic 3.6L 6-Cylinder #CUSTOM Cape Coral Chrysler Dodge Jeep Ram wants to be your dealer. With the friendliest staff is Southwest Florida, the newest state of the art facility, 52 bays of service, 5 service lanes, automated car wash, free refreshments, and over 40 banks to get you the best deals possible on your new vehicle. All vehicles have an 899.99 pre-delivery service fee and a 289.99 electronic filing fee. Call Cape Coral Chrysler Dodge Jeep Ram for all your automotive needs or with any questions about our listings. Price includes: $500 - Freedom Days Bonus Cash 44CJA7 Price includes dealer added accessories. Get Jay's Price Today! ABS brakes, Compass, Electronic Stability Control, Low tire pressure warning, Traction control. 2019 Jeep Wrangler Unlimited Sport S Ocean Blue Metallic 4WD 8-Speed Automatic 3.6L 6-Cylinder #CUSTOM Cape Coral Chrysler Dodge Jeep Ram wants to be your dealer. With the friendliest staff is Southwest Florida, the newest state of the art facility, 52 bays of service, 5 service lanes, automated car wash, free refreshments, and over 40 banks to get you the best deals possible on your new vehicle. All vehicles have an 899.99 pre-delivery service fee and a 289.99 electronic filing fee. Call Cape Coral Chrysler Dodge Jeep Ram for all your automotive needs or with any questions about our listings. Price includes dealer added accessories. Get Jay's Price Today! ABS brakes, Compass, Electronic Stability Control, Front dual zone A/C, Heated door mirrors, Illuminated entry, Low tire pressure warning, Remote keyless entry, Traction control. 2019 Jeep Wrangler Unlimited Mojito! Clearcoat 4WD 8-Speed Automatic 3.6L 6-Cylinder #CUSTOM Cape Coral Chrysler Dodge Jeep Ram wants to be your dealer. With the friendliest staff is Southwest Florida, the newest state of the art facility, 52 bays of service, 5 service lanes, automated car wash, free refreshments, and over 40 banks to get you the best deals possible on your new vehicle. All vehicles have an 899.99 pre-delivery service fee and a 289.99 electronic filing fee. Call Cape Coral Chrysler Dodge Jeep Ram for all your automotive needs or with any questions about our listings. Price includes dealer added accessories.